1 Doc. 1. et 2. Choose an appropriate title for both documents. 2 Doc. 1. 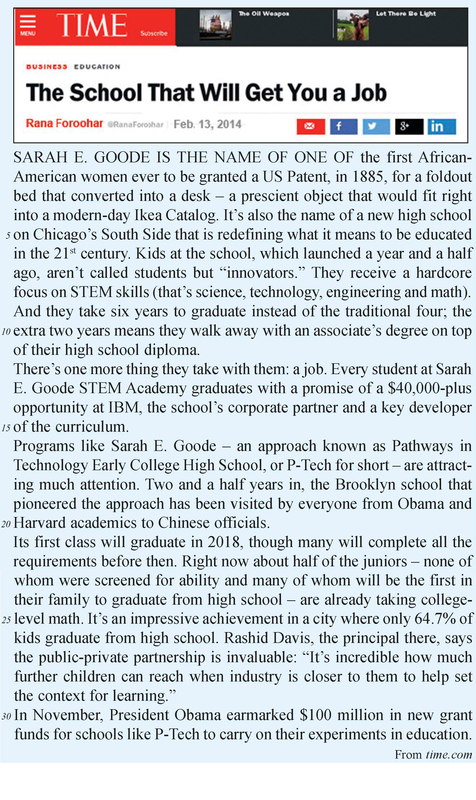 Sarah E. Goode High School is situated in …………… (city) in ………………(country). 3 Doc. 1. Choose the right statement. b. in the 20th century. c. in the 21st century. 4 Doc. 1. a. Copy the table onto your paper and complete it. b. True or false? Justify by quoting the text. 1) Most of the students at Sarah E. Goode High School come from well-educated families. 2) You need to pass an exam in order to attend this school. 5 Doc. 1. a. Choose the right answer. 1) selects the students admitted to the school. 2) selects the teachers who work at the school. 3) provides training in computer science for the students. 4) offers a job to the students who get their diploma. b. In the list below, choose the statement that best explains Rashid Davis’s opinion on the impact of partnerships with companies on schools. 1) It terrifies students because the level is too high. 2) It motivates students to work harder. 3) It makes students believe they are talented. 4) It helps students identify with adults. 6 Doc. 2. Choose the right statement. a. new teaching methods in US high schools. 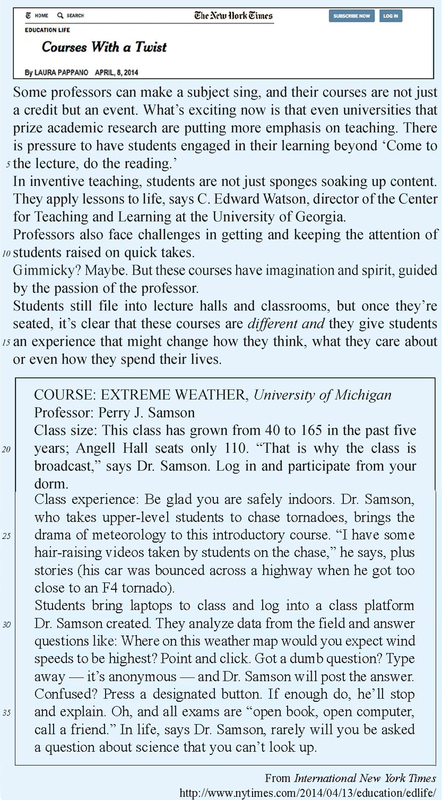 b. new teaching methods in US universities. c. the financial problems faced by American students. d. the training of teachers at the university of Georgia. 7 Doc. 2. Choose one of the 4 verbs in italics to describe the relation between the first part and the second part of the document. The second part illustrates – contradicts – explains – sums up the first part. 8 Doc. 2. True or False? Answer and justify by quoting the text. a. must come to class to follow the course. b. have to raise their hands to interact with him. c. are encouraged to ask any question they like. d. are allowed to use resources during tests. 9 Doc. 1. et 2. Copy the table onto your paper and write the number of the statement in the appropriate columns. a. were interested in literature? b. wanted to work right after school? c. didn’t like speaking up in class? d. wanted a new approach to learning?